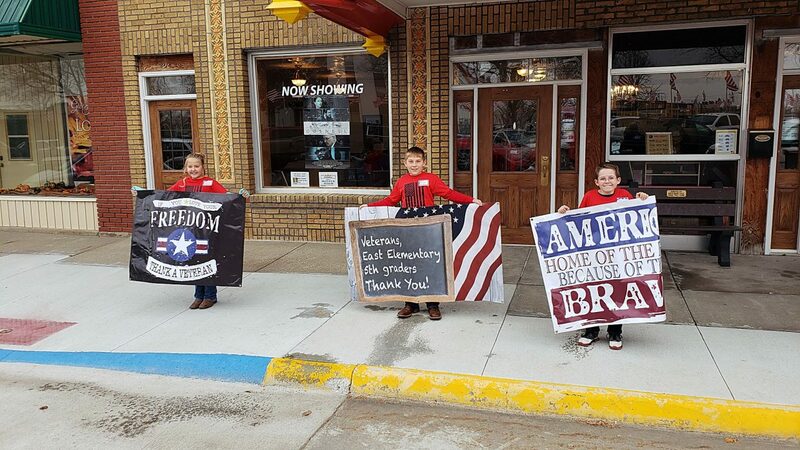 As veterans arrived at the historic Blair Theater in Belleville, Kan., for the special fifth graders' tribute to vets, students were eager to welcome the veterans as soon as they appeared. You thought it’d be much better back home-did ya? As 50 Belleville, Kan., elementary school students were joined by 100 veterans and their spouses during a special tribute and patriotic chorus honoring veterans’ wartime service, this (above) hard-hitting combat re-make of the inspirational “Hallelujah” hymn brought misty eyes to many in attendance. One veteran, emotionally choked up, took a needed break out in the hallway. The annual program by East Elementary School fifth graders in Belleville was co-hosted by their teachers Jennifer McCarty, Brenda Ritterling and Connie Reedy, with patriotic songs conducted by music teacher Portia Schiltz. To accommodate the enthusiastic veterans community-wide, the program was held inside the historic Blair Theater in downtown Belleville, where the fifth graders hurriedly walked in an organized line in the frigid Kansas wind the four blocks from school, to welcome veterans inside the theater building. Even before veterans arrived, each was already eagerly anticipating meeting the specific fifth grader who had handwritten and mailed a personal invitation to each vet, welcoming him or her to the Nov. 12 program. Veterans were encouraged to visit with the particular fifth grade student who had sent them the letter. The veterans were treated to an uplifting collection of patriotic and inspirational songs, the music was interwoven with moments of special words from students taking the microphone, to speak from the heart. Directly addressing veterans, some students stated that even though these brave soldiers didn’t personally know all the names and faces of the people they were defending back home in America, they never flinched; bravely fighting for and representing the United States. As the students sang, a choreographed power point presentation showing a collection of patriotic pictures drawn by the students and played on an oversize projector screen brought smiles, and sometimes tears to the vets and their families in the packed audience. In an energetic, regaling Armed Forces Salute, veterans were asked to stand, if possible, when their particular branch of service was mentioned in the song, coinciding with students raising the five flags representing the U.S. Army, Navy, Marines, Air Force and Coast Guard. A notable highlight featured each veteran introducing themselves, sharing their branch of service, and the war in which they served, which included World War II, Korea, Vietnam, Desert Storm and others, as teachers passed the microphone to them down each seated row. The nearly 100 veterans and proud family members listened intently, to hear their words. As veterans publicly thanked the student who sent the invitation, the children beamed and joyfully nudged each other, thrilled to be acknowledged by their invited soldier who bravely represented America. The fifth graders sold Christmas wreaths from the local Kasl Christmas Tree Farm, with proceeds from wreath sales geared to the Veterans Day program and for the free lunch for vets and their families, after the program. 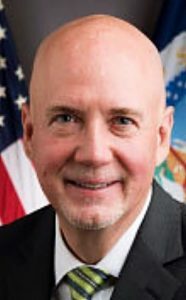 A donation is also made to a veterans’ organization. After the students and audience saluted the American flag for the Pledge of Allegiance, the veterans version of the “Hallelujah” hymn was sung as a candle-lit student chorus shared the emotional words, relating to the stark realization of an often heart-wrenching day at war (SailorJerriMusic.com-Hallelujah). It was an emotional song that visibly impacted several in the audience.